We all know it can be hard to eat healthy NORMALLY! But it’s even MORE SO around the holidays when there are so many tempting treats, and so many events and parties where food is the centerpiece! So instead of resenting that aspect of the holidays season when you have fitness goals you’re working towards, I like to show people that it’s possible to stay committed to your goals AND enjoy the holidays at the same time! Part of this is about balance – making sure that you’re eating healthy most of the time, while still allowing for little treats and cheats here and there. I don’t think it’s sustainable to ALWAYS abstain from treats. At least in my experience, that’s been a recipe for disaster in the long term! While figuring out that balance can be tricky at first, creating those spaces in your week for little cheats makes it much more possible to stay the course in the long term! So what does that mean for us in the holiday season? All the more so, balance is key! You ARE going to have days when you want to cheat, when you’re asked to contribute a dish to a party, or when the kids are clamoring for holiday cookies. And instead of DREADING those moments, I started to look at those situations as a way to create OPPORTUNITIES to find and make foods that both taste good, are within my meal plan, and which also appeal to my audience! My goal is to share some healthier, less waistline busting, lower sugar/butter options to add into your holiday repertoire. So with that being said…let’s bring on the treats! 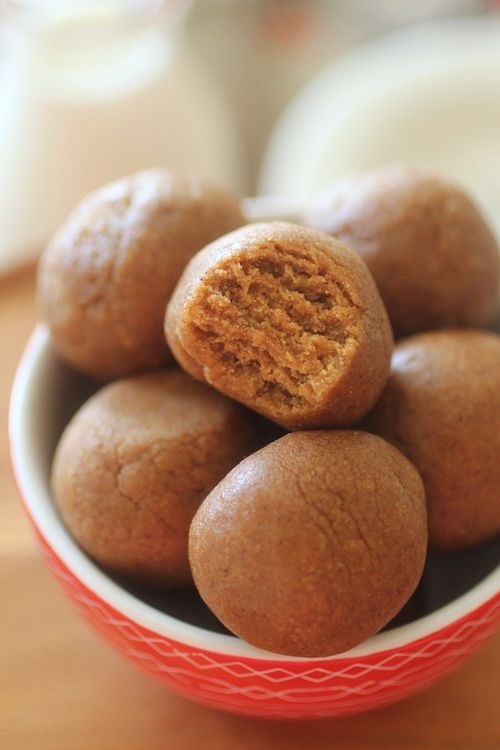 Combine the maple syrup/agave nectar , coconut oil, and cinnamon in a pan on low heat. Stir until the coconut oil has melted and everything is mixed. Line a baking tray with parchment paper and spread the pecans over it. Pour the mixture onto the nuts and stir everything together. Place the tray in the oven for about 10 minutes (pecans should be golden brown – not burnt). While the pecans are baking, melt the cacao butter and then pour it into a mixing bowl with the cacao power, salt, and maple syrup/agave nectar. Use a spatula to mix everything together and allow it to thicken. Line a dish or baking tray with a new sheet of parchment paper and pour the chocolate mix over it until it is a little less than half an inch deep. 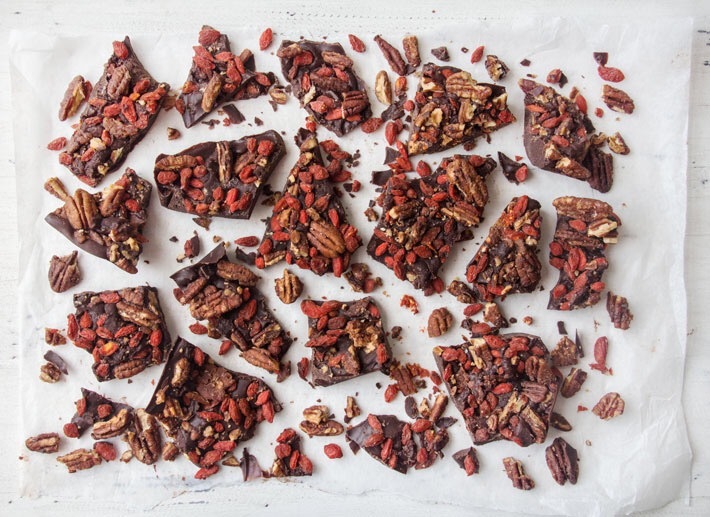 Then sprinkle the pecans and goji berries over it, using a spatula to gently press them into the chocolate so they stick. Place the tray in the freezer for about 2 hours. Once the chocolate is really solid, remove it from the freezer and break it up into chunks. Be sure to leave yourself enough time for this one – must be done in stages! Combine the crust ingredients in a food processor and process for 30 seconds until combined. Line a mini cupcake pan with paper liners (24) and set aside. Press the crust dough into the bottom of each cupcake liner (about 1/4 inch high) and place in the freezer. In a medium saucepan, combine the first four ingredients of the salted caramel sauce and cook on low heat. Whisk until butter is melted and sugar has dissolved, then turn the heat up to medium and gently boil. Add in the vanilla extract and salt and whisk until combined. Increase the heat the medium-high and bring to a boil for 2 minutes. Then remove from heat and whisk gently until the mixture becomes a smooth liquid again. Place it back on the heat to boil for another 2 minutes to thicken again, then remove from heat and whisk until the mixture becomes a smooth liquid again. Repeat this process two more times until the consistency is that of a thick soup. Cool the sauce slightly and then transfer it to a container with a lid. The caramel will continue to thicken as it cools but you want it in a pourable state. To make the filling, drain the cashew pieces that have been soaking and put them in a blender and blend until they are broken into pieces. Then add the coconut oil, coconut milk, pale syrup, and vanilla. Blend until smooth. Next add the zucchini, coconut sugar, salt, and lemon juice. Blend until smooth and creamy. Remove the crusts from the freezer and pour the cheesecake filling evenly into each liner. Leave about 1/4 inch at the top for the caramel sauce. Then place back in the freezer to set for at least 2 hours. Remove the mini cheesecakes from the freezer 15 minutes prior to serving so that they can thaw. Pour the salter caramel sauce into a resealable ziplock bag and cut one corner off. 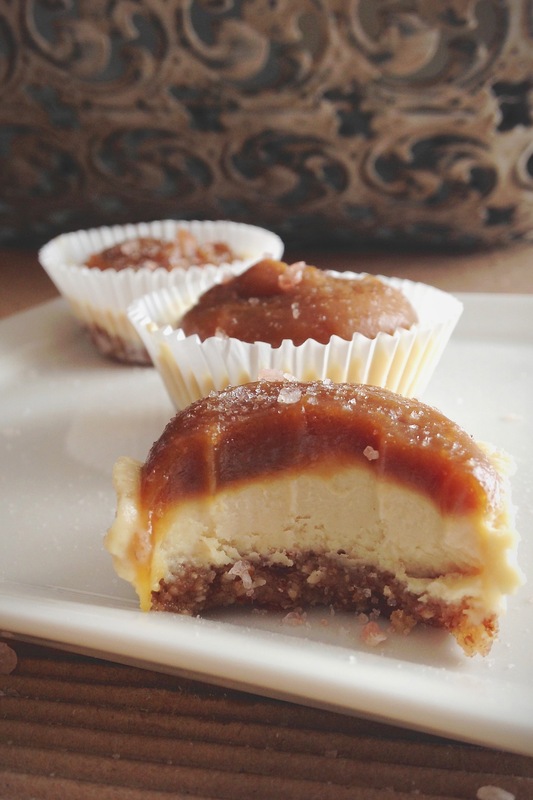 Squeeze a dollop of caramel on top of each cheesecake bite. How about we dial it back and try something super low maintenance compared to the last tasty recipe? Combine all ingredients in a food processor except for the maple syrup and process until mixed. Add in the maple syrup and process again. Scoop out the batter and form 1/4 inch balls. Place them on a baking tray lined with wax or parchment paper. Place in refrigerator to chill and enjoy! Combine all ingredients except the chocolate chips in a food processor and blend until completely smooth. 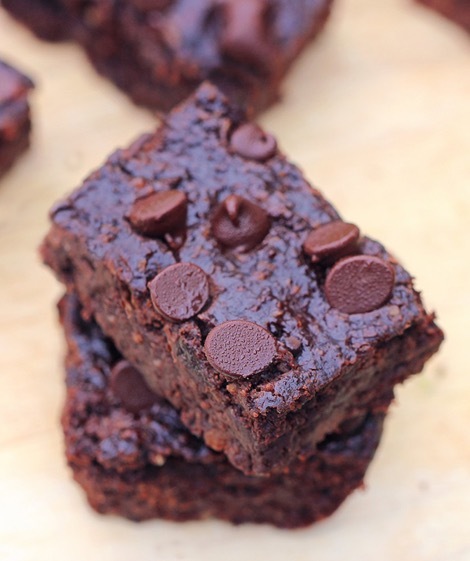 Cook the brownies for 15 to 18 minutes, then let cool for at least 10 minutes prior to cutting. First of all, don’t go to a holiday party starving! Eat a healthy meal before the party, and then you won’t be as likely to indulge in all of the unhealthy options once you’re there! If it’s a potluck, bring something healthy so you know you at least have that! Next, plan ahead! If you know you’re going to have a few adult beverages or desserts, scale back on your carb intake earlier in the day, and load up on protein and veggies instead! Hopefully you picked up a few recipes and tips that you can put to good use this weekend as you celebrate with your friends and family! I wish you all a safe and happy new year!